What happens when you drop a spoiled suburban American teen into a poverty-stricken area of Africa? 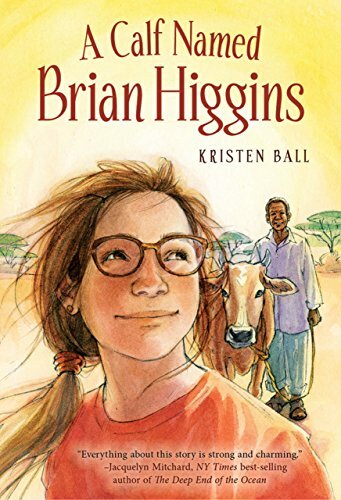 Hannah enters A Calf Named Brian Higgins: An Adventure in Rural Kenya as a rather typical spoiled whiny teen used to cell phones, malls, and clean water, who might be acting out a bit, as her parents often quarrel, and she exits the story with a new world view. When Hannah goes to Africa to visit her Uncle Brian with her mom, she learns how a huge segment of the world’s population lives, and it’s not anything she could have imagined. A Calf Named Brian Higgins covers a lot of territory and many global and social topics while it’s an engaging, heart-tugging story bound to leave the readers a little teary at times and sincerely humbled at others. Tucked seamlessly into the story-telling in a skillful avoidance of info-dumps, facts about world hunger, poverty, and health have a greater impact than a simple reporting of the facts. Hannah makes friends, tries the local cuisines, and goes quite a long time between showers as she learns why her Uncle Brian adores this area and people. Proud, happy, helpful people aid Hannah as she journeys between cultures, trying her hand at crafts and visiting a local school and health clinic. While her mom helps at the clinic, her dad stays in America, unwilling to venture into the world that his brother loves so much. This is a sweet must-read for anyone, from middle-school to adult, who would like to open their child’s eyes or have their own eyes opened and to feel for just a moment a little bit dusty and thirsty. The story is so engaging and the lessons so real, I don’t think anyone can put this book down and leave its lessons behind. Very sweet, very pertinent, very engaging. Highly recommended. Thirteen-year-old Hannah Higgins is convinced her summer is ruined when she is forced to travel to Africa and work in a remote village in Kenya with her mom and uncle. Never having been to a developing country, she finds the food gross and the community filthy. She has to live without electricity or running water. Then she is told she must attend school. Just when she thinks nothing could make this trip any worse, she learns people there are dying of hunger and preventable disease. Hannah becomes frustrated and wants to help, but when poverty threatens the lives of people she loves, all she wants to do is go home.